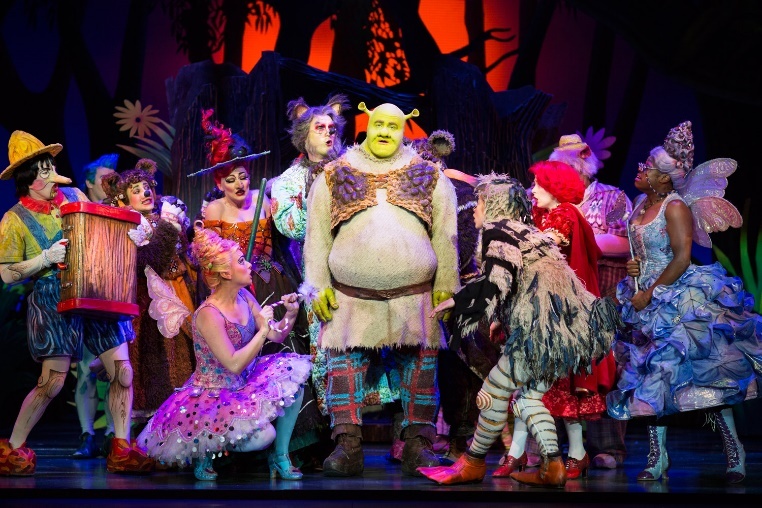 As the Shrek UK tour draws to a close, it was fun to catch up with the show’s final week at Manchester’s Lowry Theatre. Long long ago, before Shrek became a stage musical, it was an award winning DreamWorks movie that stole the hearts of adults and children alike. Upon its release in 2001, Shrek won the first ever Academy award for Best Animated Feature, as well as receiving countless nominations at the BAFTAs and Golden Globes. The story follows the tale of loveable ogre, Shrek and his trusted steed Donkey, as they head out on a quest to rescue the Princess Fiona from a dragon-guarded tower. Meanwhile and elsewhere, formidable if miniscule and extremely short tempered Lord Farquad has banished the Kingdom’s fairy-tale creatures to exile In Shrek’s swamp home. From the get go, the set engages the audience with vibrant colours and fabulous detail, throwing us into Shrek’s fairytale theme. The writing sparkles, with numerous references to other big musicals including Les Miserables, Miss Saigon and Wicked – and when the Dragon (brilliantly voiced by Candace Furbert) is revealed, the detail of the puppetry behind the creature is exquisite and almost identical to the creature in the film. Shrek, played by Dean Chisnall is an instantly likeable character, notwithstanding a few accent wobbles. A few bars into his first song however and the audience was left with no worries. He is a fabulous performer with a voice that would leave most envious! Idriss Kargbo’s Donkey is a lovably hilarious character with perfect comedic timing, effortless charm and strong vocals. 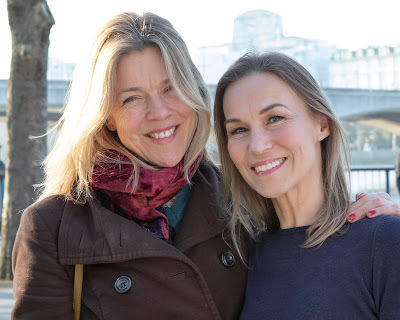 Likewise Bronté Barbé, who played the tomboyish Princess Fiona with a committed performance and impressive dancing, though their might just have been a hint of end-of-tour fatigue creeping into both of these performances. Gerard Carey however was a delight as the dastardly Lord Farquad. The tour's director Nigel Harman had originated this role in the UK in an Olivier-winning performance at the Theatre Royal Drury Lane back in 2011, so one might perhaps a touch of excellence here. Carey’s vocals are good but it’s his character that really steals the show. His commitment to the role is genius and his comic timing and the way he has adapted to performing the whole show on his knees to adopt the illusion of being so particularly short, deserves praise indeed! Overall the show itself is fantastic, the ensemble are tight and perform powerful and impressive numbers that entertain and enlighten. 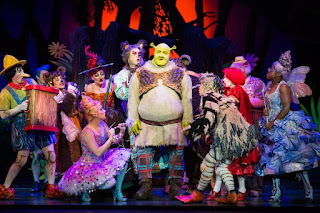 Whilst this tour maybe ending, Jeanine Tesori’s bright and uplifting music and David Lindsay Abaire’s witty lyrics should ensure that Shrek remains a family favourite for many years to come.